So by the time you’re reading this, I’ll be 40 weeks along and maybe I’ve even had the baby! Either way, this is my final vlog during this pregnancy (see you for my next round of preggo vlogs in a couple of years hopefully!). I’m so grateful to those of you who have followed along with our pregnancy. It’s been such a beautiful experience to share this with you and to hear your thoughts, suggestions and comments along the way. I’m wishing all of you tremendous love, best wishes and all the best of things along your journey, whatever that looks like for you. I will be back with my birth story in the coming weeks as well as my post partum vlogs. She is fully grown now! And is between 19-21 inches (48.3-53.3 cm) tall and 7-8.5 pounds (3.2-3.6 kg), about the size of a small pumpkin. Natural induction methods in full force! My midwife is now officially back in town. She got back today (Sunday!) and since I’m 39 weeks + 4 days pregnant, I’ve been given the all clear to start using Clary Sage oil. I’ve continued the evening primrose oil, and I actually ran out of red raspberry leaf tea, so tomorrow I’m going to buy some more and do a Labour Day Tea from Mama Natural. Tonight I gave myself an acupressure massage focusing on the inside of my ankles using Clary Sage. I also massaged a couple of drops in to my belly and I’ll be using the diffuser tonight. I walked a lot today and bounced on my birthing ball. So we will see if any of this helps. Monday (tomorrow) I’m doing acupuncture and having a stretch and sweep so fingers crossed the combination will help move things along so that I don’t have to worry about a medical induction. I think I’ll be allowed a couple of days past my due date but not many more than that, so here is hoping she comes this week! Nothing challenging this week again, I mean I’m certainly less mobile than usual and I’m waddling all over the place! I had some disappointing news about our renovations. Our finish date was meant to be my due date of the 10th but they’ve added at least another 10 days on top of that. Some contractors just decided not to turn up which is frustrating, but it’s really par for the course when it comes to renos. I don’t know of anyone who has actually had renovations finish on time! Honestly we have made it so far that as long as the dirty and dusty work has finished (which it should be in time for the birth), then I’ll be fine. We will close that part of the house off anyway and keep baby girl away from that area. Today! I did all the finishing touches today. 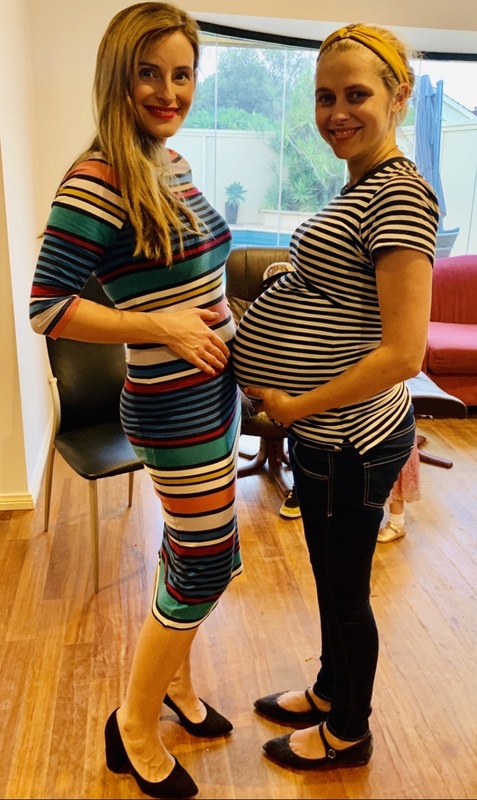 I added a couple of things to the birth bag; an extra birth outfit designed by my gorgeous fellow preggo, bestie and one of my birth team Claire Hoban (pictured above!) It’s called Háves, and it’s the most gorgeous labour dress which also doubles as the perfect postpartum dress with the snaps in all the right places to support nursing! I actually did a little shoot for them this week. It’s so pretty and soft, and Claire gave it to me to wear for labour! I also packed some body oil in case of an out-of-water birth and my birth affirmation cards that one of my other besties Cass made for me. I also set up the back of the car, with absorbent pads everywhere and towels in case my water breaks in the car again! I vacuumed the car out and cleaned the whole thing out so it feels clean enough to transport her home after the birth! Wearing the Háves labour dress. Soooo soft and pretty! I also set up our SNOO (thanks Happiest Baby) it was seriously a GODSEND having it with Forest. He loved it so much, we lugged that thing with us everywhere on our travels! He transitioned so smoothly out of it too, which was something I was curious about when I first got it. 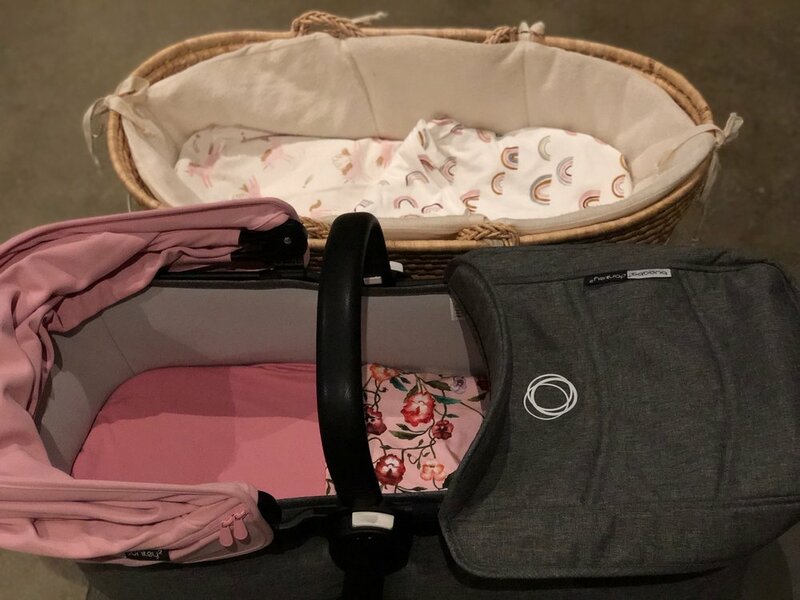 This time around, I really wanted one here in Australia and luckily I partnered up with Happiest Baby, so I received one that is sitting right next to the bed ready for baby! I also put together the Bugaboo pram and chose a couple of beautiful blankets to put in there. I dressed the wicker basket with blankets which will be one of her sleeping areas out in our main living space and got out the nursing pillow for extra neck support. I just can’t believe it!! I just want her here and in our arms, it’s so amazing to think it’s days away. 145.5lbs/65.9kg My finishing weight! I put on a total of 31.5lbs this pregnancy which is the most I’ve put on for all three pregnancies. I started a bit lighter this time around and ended 2.5 pounds heavier than Bodhi and Forests pregnancies. It seems that this is just my finishing weight no matter where is start. My hips are starting to hurt now but I got a prenatal massage with my other birth team bestie and also fellow preggo Kat, so that helped ease some of the discomfort. Preggo pals getting massages and chatting birthing day plans! Mark and I are giddy with excitement, we can’t believe we are days away from adding a little girl to our crew. We are just both on cloud nine, and can’t wipe the smiles off our faces! I re-watched Forests birth video and watched my birth Vlog to remind myself of how the birth went. I’ve also been listening to Dr Berlins Informed Pregnancy podcast which I LOVE. I’m seriously excited and don’t know how I’ll sleep until she gets here but God knows I need it. The feels are so mixed, I get hit with pangs of nervousness and anticipation and then emotional thinking about having her here. All Bodhi asks is “when is baby sissy coming?” It’s pretty cool to be able to say to him, “probably within the week!” He asked me when he can bring her for show and tell. I just love his enthusiasm and all the kisses Forest has been giving my belly. Yesterday at the park he kept bringing sticks over and handing them to the tummy saying it’s for our baby to play with.